ENID, Okla. — Advocates for legalized recreational marijuana have had little success getting their cause to a vote of the people in Oklahoma. Their goal may be within reach now, thanks in part to public backlash against emergency rules limiting implementation of State Question 788, the medical marijuana question voters passed by a margin of almost 57 to 43 percent on June 26. Emergency rules to implement SQ788 approved by the Oklahoma Board of Health and signed by Gov. Mary Fallin last Wednesday include a ban on smokable and some forms of edible cannabis and a requirement that dispensaries have a pharmacist on staff. Those limitations on SQ788 have angered medical marijuana supporters, driving more people to sign petitions for State Question 796, which would add an amendment to the state constitution to define medical marijuana as an herbal drug, and State Question 797, which would legalize recreational cannabis, say supporters of the petitions. But advocates for both medical and recreational marijuana aren’t waiting for future modifications to the rules. Green the Vote, a cannabis advocacy group, filed a lawsuit Friday against the state, Fallin, Oklahoma State Department of Health and five members of the board of health — one of at least two lawsuits filed over the emergency medical marijuana rules. Grassroots efforts to bring recreational marijuana to the state ballot in November also have increased since Fallin signed the rules, said Green the Vote spokesperson Shelley Free. “People who voted for State Question 788 are angry that the will of the people has been ignored by the highest office in our state,” Free said. That anger has driven a sharp increase in signatures for SQ796 and SQ797, she said. Tracy Ullrich, owner of Enid CBD Co. at 721 S. Oakwood suite A1, said he’s seen a significant increase in the number of people coming to his shop to sign petitions for SQ796 and SQ797 since Fallin signed the emergency rules last Wednesday. He’s had to request new forms since the rules were signed by Fallin, and as of Friday had more than 200 signatures waiting to be turned in. He attributed the increased rate of signatures to frustration over the emergency rules on SQ788. Cannabis advocate Michael O’Brien also said he’s seen an increase in and diversification of people signing SQ796 and SQ797 petitions. O’Brien has been taking petition signatures daily at a makeshift stand in front of the shuttered Kmart at 4010 W. Garriott. He’s been volunteering on campaigns for a state question to legalize marijuana since 2011, and said he’s never seen the number of people signing petitions jump like it has since the emergency rules were signed. He’s been averaging about 40-60 signatures per day, “from all kinds of people, including a lot more older people.” His oldest signers were a couple in their late 80s and early 90s. More people are signing the petitions, O’Brien said, because they feel like they’ve been lied to with the emergency rules on SQ788. The push for signatures to bring legalized marijuana to a vote of the people has spread beyond long-time cannabis advocates and shops specializing in hemp and cannabis-related products. Enid attorney Robert Faulk said he’s had petitions for SQ796 and SQ797 out for several weeks, and signatures increased leading up to passage of SQ788. Faulk said legalization of marijuana would cost his law firm “a lot of money” due to lost business defending arrestees. He said he advocates passing SQ796 and SQ797 because of a “moral objection to incarcerating people for long periods of time for drug use,” and concerns over how the state is handling implementation of SQ788. When the board of health released the emergency rules on medical marijuana last week, Faulk put up a Facebook post on his firm’s page inviting the public to come to his office at 109 E. Randolph to sign the petitions. “We hadn’t really been pushing it much before that,” Faulk said. He felt inclined to publicize the petitions after the emergency rules were signed, he said, because he was frustrated by the board of health making the rules without involving medical marijuana stakeholders, the crafters of SQ788 or state legislators. Free, with Green the Vote, said more signatures are coming in for SQ796 and SQ797 now because voters see the state’s rules as an attempt to undo SQ788. 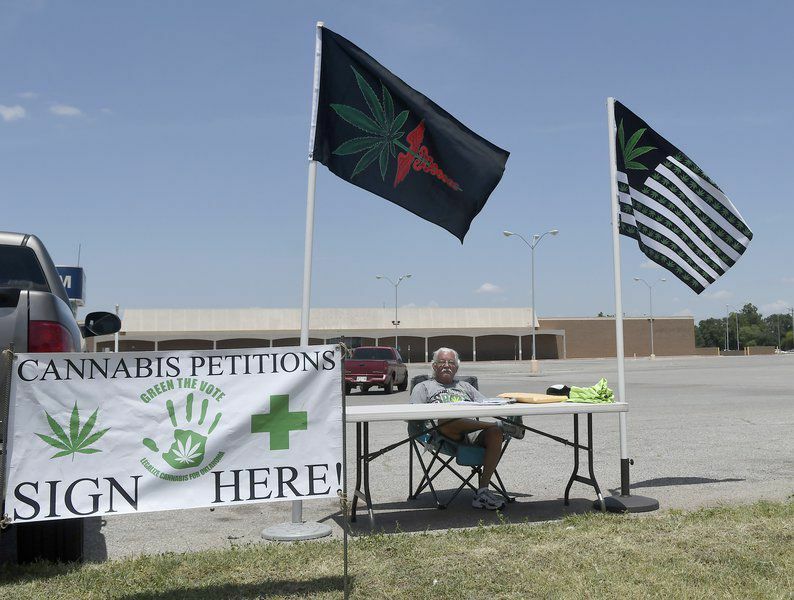 When the Oklahoma Secretary of State’s office cleared Green the Vote to collect petition signatures beginning on May 11, the group had until Aug. 8 to collect almost 124,000 signatures. More than 20,000 signatures came in last week alone, putting the group over the 100,000 mark. “We’re not worried at all about having enough signatures now,” Free said. The new goal, she said, is to collect enough signatures to make the petitions immune to legal challenges. Free said there’s little doubt voters will have their say on recreational marijuana this November, and she expects the backlash over the emergency rules on SQ788 to impact more than just marijuana laws.